I've played a great many RPGs throughout the years. In that time, I have seen many design decisions constantly repeated and reiterated across various different games. Often it makes sense to reuse these tropes. For example, leveling up is such a core concept in RPGs that it would be strange to have no form of character development. However, some of these same choices come back for seemingly no reason whatsoever. Recently, I beat Final Fantasy Type-0 HD, victim to one of the latter design choices. Taking place in a steampunk/fantasy setting, Type-0 is a war story following the exploits of Class Zero, a group of cadets at the military academy in one of the four great nations in the world. There are 14 members of Class Zero, all playable characters in the game. The player can have, at most, 3 of the classmates deployed at the same time, with other members on standby. When an enemy is defeated, only the 3 deployed classmates gain experience, while every other character gets nothing. 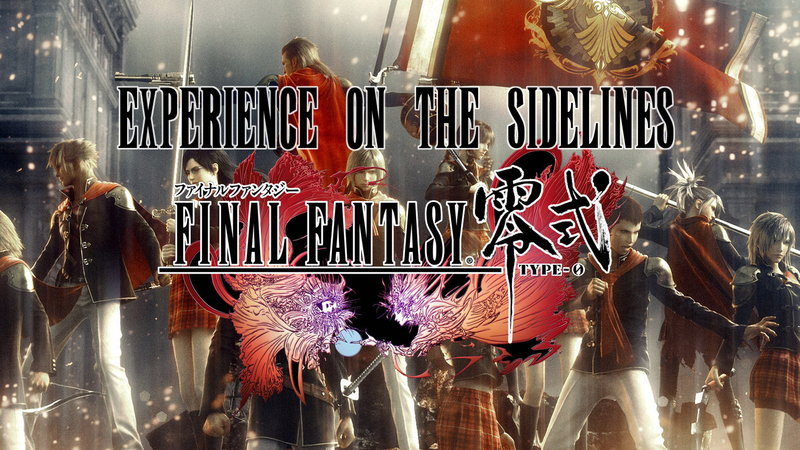 And while Final Fantasy Type-0 is hardly the first RPG to make this choice, it’s the one I can best use to explain the problems inherent to it. Depriving non-participants of experience discourages players from experimenting with their party formation and character selection. When Final Fantasy Type-0 first introduces the player to the full cast, it makes the recommendation to "try to level every character evenly". This, as is the case with most games where members on standby don't gain experience, is a terrible idea. Following this advice will have one of two possible outcomes: Either the party will be so under-leveled that playing through main story missions is an exercise in frustration, or so much time will be spent grinding for experience that the player will completely forget the main story. Raising a character by a single-level takes a great many battles. With 14 playable characters, bringing them up to each missions recommended level would take several hours of tedious grinding. At the same time, missions at a much higher level pit the player against enemies that can and will annihilate a single character in one or two attacks. For this reason, most players will ultimately decided on 3 or 4 characters that they will focus their experience on, and largely ignore the rest of the them. Part of the draw of a large pool of playable characters is that there is a variety in the archetypes and playstyles. Under the restriction that party members only level up when they actively partake in battle, this variety is stifled by practicality. For instance: there might be circumstances where it would make more sense to use a long-range party of King the duel-pistol wielder, Cater the magic-gunslinger, and Trey the archer, like when a mission is packed with flying enemies out of melee range. However, most people will likely only have one of them leveled enough to use in that mission. While it may make more sense to use that particular party against ranged enemies, it makes no sense to use it in any other circumstance. Since it's only sensible to train up about 4 people, most players will have a strong melee-character, a good ranged character, and a support, with a possible backup character in the event one of the first three dies. Any thought of changing up the party to suit a new situation, or experimenting to find a formation that may work better, is thrown to the wayside in favor of sticking with the old and familiar. On top of that, games with sufficiently large casts nearly always have scenes where the party has to divide itself into multiple groups, and Final Fantasy Type-0 is no exception. Several missions have the player form 2 groups of three cadets each. Since the odds are that most players will only have enough characters leveled up for one full battle party, this section is significantly worse than it should be. Practicality, it ensures that one team will be vastly inferior to the other, or that both teams will have one under-leveled character dragging them down. In either case, battle ability is severely reduced because the player has done exactly what the game's systems have incentivized them to do. In my playthrough, during the first of these missions, both of the parties had two characters that were Level 30, and one trailing far behind at Level 15. Unsurprisingly, the weak one in each party did hardly any damage, spending most of the mission as a corpse. With two characters left to pick up the slack of a three-person job, I didn't have as much fun with these missions as did with the others in the game. I had to restart this mission several times because, with the addition of my undue handicap, the enemies were just strong enough that my two level 30s in one team taking much more damage any dying more than they had in other missions. At one point, I even had to give up, go into a previous save, and rethink who I sent with which team. Needless to say, I was fairly unhappy with the game for crippling me like that. Even though it’s extremely clear that this one concept hurts the games that use it, it is unlikely to get phased out anytime soon. As a genre, RPGs are soaked in tradition, making it difficult to weed out overused design cliches. Even worse, this is one that appears frequently, even in many of the greats like Persona 4 and Valkyrie Profile. Knowing this, I still think it's healthy to evaluate these game design tropes to see if they're still worth maintaining. Though it's common for the reserve party to not gain experience, this trope does more harm than good.